Text Box Templates take your hand-picked information from the Production Sheet to be displayed in text boxes. Because of this, the Production Sheet must have, at the very least, the information you wish to display in the text box. 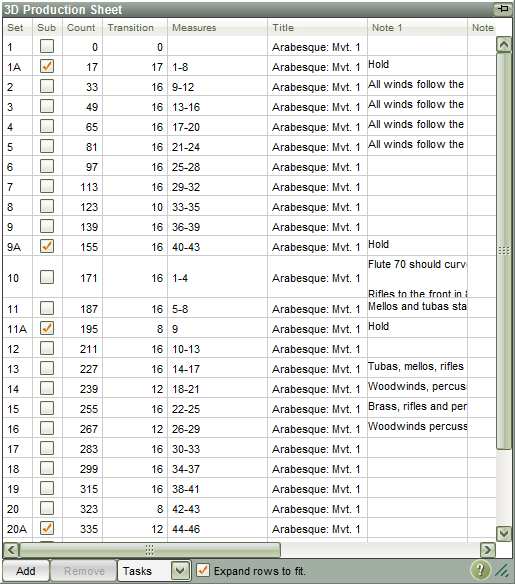 Much of this information is input in the Production Sheet when you add sets to the drill. Columns like Set, Subset, Count and Transition will all have data based on the pages on your Count Track. The Measures, Title, and Notes 1-5 columns are user defined and would display nothing without your input. First and foremost, pages must be present in the Production Sheet before you can add any other related information. To add a page, click the Add button at the bottom. A new window will appear, where you can add a page to the entered count for the drill. You can add as many pages as your drill requires; there is no minimum or maximum limit to the number of pages a drill can have. *By default, a new drill has 300 counts. If you need to add counts to a drill, go to the Utilities menu and choose the Count Editor. There you will find an option to add or remove counts from a drill. Once your pages are entered, you can then begin entering information in the Title, Measures and Notes columns. Click in the cell you wish to enter in information, enter the information, then you can click out (off) the cell when done.